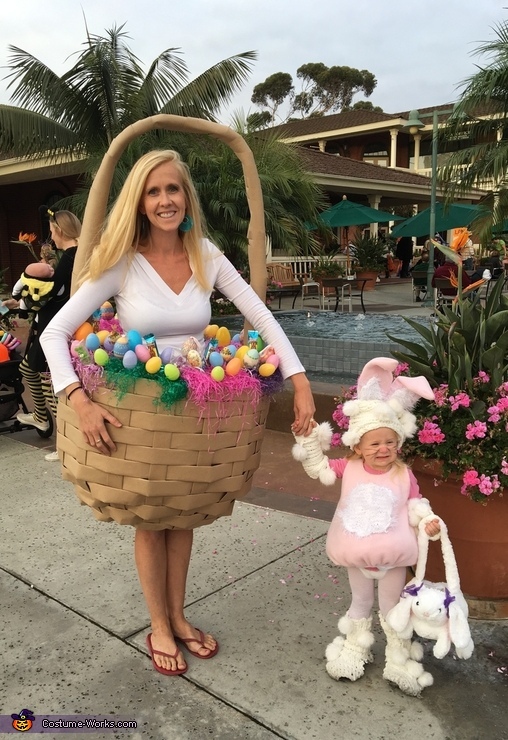 This homemade costume for families entered our 2017 Halloween Costume Contest, and won 2nd place in the Most Creative Costume nomination! My daughter Truly loves to hop like a bunny so I decided she had to be the Easter bunny. I made her bunny costume out of 2 scarves I found at the thrift store. I just love her big tummy. I wanted to be a themed couple so I wove brown paper around a cardboard box. I used a hula hoop for the round shape. I had to borrow some plastic eggs from people as finding eggs during Halloween is pretty hard :) Everyone loved our costume. But kids kept thinking they could take the candy eggs from my costume. It was pretty funny.